How to Soundproof a Sliding Glass Door the CHEAP Way! Blog How to Soundproof a Sliding Glass Door the CHEAP Way! Most homes have at least one sliding door, usually, the door leading to the back deck. Some of these doors are good at blocking unwanted noise, and the rest are quite inadequate at soundproofing. But one thing they all have in common is that there are things you can do to make these sliding glass doors more soundproof, and that’s what I will be talking about in this article. There are many ways to soundproof a sliding glass door, but the best way would be weatherstripping and special door sweeps. There are more ways to reduce the noise coming in from a glass door below so keep reading. Glass doors are a pain to try to soundproof because either way, you will need to cover the glass in some way to block the intruding noise. Of course, when you block the glass, you mostly make a glass door useless by not being able to see the view. I will be focusing on sliding glass doors for indoor and outdoor as well. The reason people are trying to soundproof their sliding glass door is that this is a much higher area for sound pollution than wood doors are; because for a wood door, you would only need to buy a thicker and sturdier door. I will also be talking about other methods to soundproof a sliding glass door. Soundproofing a sliding door is much more difficult than a traditional swinging door. Add a Second Sliding Glass Door! Sliding glass door noise reduction. The first thing you need to do is to seal all the cracks around the sliding door that may have formed due to aging or weather. Make sure there are no air gaps where noise could come through. You can slowly pass your hand around the door. If you feel cold air (in colder climates) then you know there is an intrusion. A millimeter crack will make a huge difference as to how much noise from outside comes into the home. Make sure it’s sealed shut with special soundproofing caulking. What’s nice with this type of caulking is that over time It will remain flexible, so no cracks develop. Another great way to seal the bottom crack on an interior sliding glass door would be to install a small door sweep. We have a sliding glass door leading to the laundry room from our kitchen. I installed a sweep to minimize noise coming through from the washer and dryer. The door sweep that I used is the Energy Efficient Door Under Seal Door Noise Stopper & soundproofing Door Weather Stripping from Amazon. This might not be the best door sweep but this is the one I bought, and It works great for me. One big reason I chose this door sweep is that it’s very thin and also self-adhesive. It is thin enough so the door can still slide in its interior wall slot without scrapping or snagging while sliding the door. This particular door sweep is also very inexpensive, and an easy DIY soundproofing fix! There are certain types of weather strips that I found that would work very well for an interior sliding glass door. You just need to make sure the weatherstrip is not too thick. If the strip is too thick, then the door won’t slide as easily. If the weatherstrip is too thin, it will allow the noise to get through from the bottom of the door. The one that I recommend after talking to a few people in a Reddit forum that had this issue with their sliding door is an Auspa duel weatherstrip from Amazon. This weatherstrip is self-adhesive for easy installation on the very bottom of the sliding door facing down. The foam should slide nicely on the floor as you’re opening and closing the door. You probably already have a curtain in front of your sliding glass door leading outside, and that curtain will help block some of the noise coming from outdoors. You can also swap it out with a thicker soundproof curtain that is explicitly made to block light and most importantly, noise. This soundproofing method would not work well for in indoor sliding door; Because who wants to hang curtains permanently inside their home? You might as well swap out the glass door for a wooden door if that’s the case. Whichever curtain you chose make sure its long enough that it touches the floor. If you leave a gap between the curtain and the floor, the soundproof elements of the curtain would be compromised. Placing a soundproof blanket on a sliding door could be a pain if you’re coming and going a lot through that particular doorway, but it could be an asset if you only want to block noise temporarily while you’re trying to concentrate. After doing some research, I found the blanket that in my opinion would work best. The Soundproof Grommet Industrial Blanket would be my top choice because of the way it’s built and the soundproofing attributes. You could simply use moving blankets but how would you go about hanging them? At least these noise reduction blankets have holes made for hanging. The holes are also reinforced with metal every 9″ on one side to hang evenly. I was watching a YouTube video of a man demonstrating a type of thick modern set of blinds on his glass door, and I was intrigued. If you watch the video, you will notice how they work, and if you add some soundproof curtains on top of having blinds, then the noise should be reduced even more. If you want to go a different route and not want to bother with soundproofing an existing sliding, then there is another option. This option will be more expensive of course but will also be much more effective. You can buy a specially made soundproof sliding door, but how much do these types of door cost and how do they work? Well, lucky for you I’ve done a bit of study into this subject. 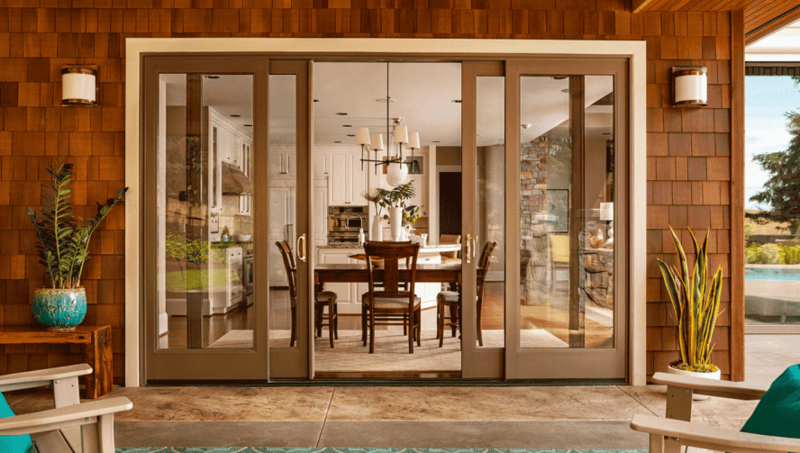 The cost of a sliding glass door would typically range from $1,300 to $4,000. The wide range in price will be due to the size of the door and also the quality of the material and construction. Choosing to buy a professionally made soundproof sliding door will have many benefits. Of course, nothing is genuinely soundproof, and a door is no exception. These types of doors do however do a fantastic job of blocking 75% to 95% of outside noise! You see a lot of these sliding glass doors in hotel rooms that are situated close to airports. This level of noise reduction is made possible by having multiple panes of glass individually separated by an air gap. It reminds me of a resilient channel. Another method that I almost never hear mention but have seen for myself how good it works is installing a second sliding glass door in front or behind the existing one. The second door adds a lot more noise reduction and also gives greater security to the home. By adding a second door, you will also be virtually eliminating the cold draft coming from the sliding door. The room with an entry such as this is usually in the room which is the coldest and draftiest. The glass is less than ideal in sealing the cold so by adding a second one you could make this room the coziest one in the house. Noise reduction of beyond 75% and upwards of 95% in some circumstances. Insulation benefits that come from having a soundproof window. There are also security benefits by installing a soundproof sliding glass door. If the doors have laminated glass, then the security aspect is significantly increased. Intruders usually target sliding glass doors because these doors are traditionally made from tempered glass. Breaking a laminated glass is much more difficult for a burglar because it takes more time and also very loud when they succeed. I hope this article helps you in some way to soundproof your sliding glass door. One thing also is to make sure is to pay attention to the STC and NRC ratings on your door before making your purchase. Let me know if you know of any other ways of sufficiently soundproofing your sliding glass door by leaving a comment below.